Bituthene® System /bituthene-4000/ is a 1.5 mm (1⁄16 in.) flexible, pre-formed waterproof membrane which combines a high performance, cross laminated, HDPE carrier film with a unique, super tacky, self-adhesive rubberized asphalt compound. System /bituthene-4000/ Surface Conditioner is a unique, water-based, latex surface treatment which imparts an aggressive, high tack finish to the treated substrate. 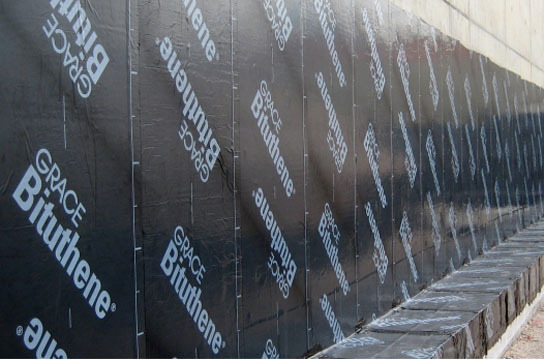 It is specifically formulated to bind site dust and concrete efflorescence, thereby providing a suitable surface for the Bituthene System /bituthene-4000/ Waterproofing Membrane. 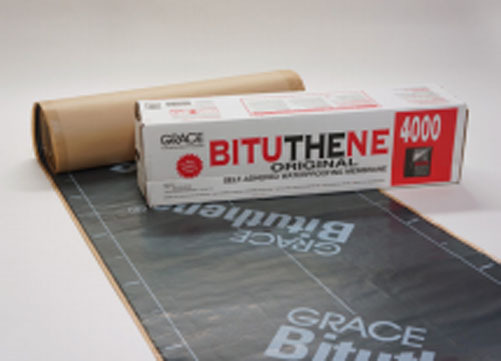 Conveniently packaged in each roll of membrane, System /bituthene-4000/ Surface Conditioner promotes good initial adhesion and, more importantly, excellent permanent adhesion of the Bituthene System /bituthene-4000/ Waterproofing Membrane. The VOC (Volatile Organic Compound) content of this product is 100 g/L.